FSP provides books, uniforms, and tuition fees for these students. To help us expand our scholarship program, please donate using the dropdown menu below. Donors receive regular updates on their students’ performance in school, their grades, and chosen study subjects. One of FSP’s longest standing projects is the Giving Orphans Education Project. In partnership with Florida International School in Siem Riep, Cambodia, FSP gives scholarships to students who demonstrate an interest and willingness to receive a high quality education but do not have the funds to attend school. 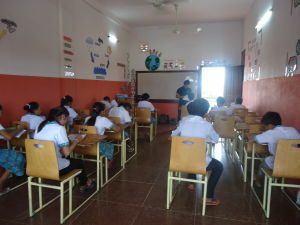 Giving Orphans Education program in Siem Reap, Cambodia is one of our long-term projects. For the last two and a half years we have been sending 7 or 8 students at a time to The Florida International School of Siem Reap. Lika, the main point of contact for us at the school, has become a very reliable liaison between FSP and the school. Even a trusting friend. In June, FSP received report cards for the students. Everyone was doing well except Ly Sunder. His attendance was low and grades were about C to C- average. Concerned, we asked Lika about his situation and she explained that Ly had a lot of sick days and had a hard time keeping up with the school curriculum. She said she would keep an eye on him and speak with him to see how we could help him improve. When an FSP supporter from Ecuador met with Ly a month prior, she said that she sensed his lack of commitment. In September, Ly’s grades and attendance were even worse. Tim discussed the situation at the FSP Board of Directors’ quarterly meeting, and we agreed to try to get the school to tighten him up as much as possible and let Ly know that if he doesn’t come around we would have to cut his sponsorship. In December, we received his report card for Sept-Nov, and the attendance and grades were even worse than before. The Board, along with Lika the school contact, had many long discussions about how to proceed. The school’s suggestion was to drop him from the program and give our efforts to a more willing candidate. 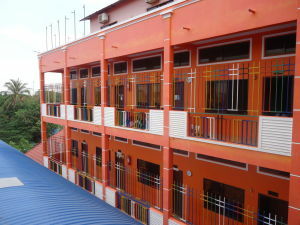 They said there are many poor children who would give anything to come to The Florida International School of Siem Reap. The FSP Board members weren’t so quick to give up on him though. After all it is troubled candidates like Ly that we want to try to save. Ly’s situation is exactly why we are in this business- to help the truly disadvantaged. He was skipping school to work on the streets and play soccer. FSP tried to wrap our heads around it and come up with a solution. Unfortunately we don’t have babysitters and truancy officers in Siem Reap like we grew up with here in the States to make sure Ly goes to school and does his homework. With a candidate more available and willing to go to school with our help, we thought we should give her a chance. In the end we decided it’s best that we listen to what the locals suggested, and trust them… after all, the school officials were basically saying, “Don’t give us your money. And if you want to give us your money, give it for a child that is going to appreciate the opportunity.” We saw it as a rather noble position. Florida International School is a good school and for 2.5 years, we have been doing a lot of good work in collaboration with them. FSP decided it’s best to not send tuition for Ly in 2016 at this point. We have agreed to enroll the female candidate that they suggested to replace Ly. We have an FSP supporter in Siem Reap this week meeting the candidate and interviewing her. She says that the candidate is an excellent fit for the FSP Sponsorship program. Our supporter this week also met with Ly Sunder to let him know that Tim and FSP still cares very much about him and would like to help him when he is more willing to go to school. The FSP representative tried to get some explanations from him but due to a large language barrier, she didn’t feel like she was getting the truth of his situation. Indi, our representative, still got the point across to him that he can ask for are help if and when he is ready. A board member and I will be in Cambodia this June to visit the school. At that time we hope to meet Ly Sunder and see how he is going without our sponsorship. Maybe by then he will have learned a bit of a lesson and have new found willingness for his future. In the mean time, we are so proud of the 7 students we have now. The first six students have been with us for an average of 2 years each and they all average A’s and B’s. All of them except one has improved in their English speaking in great strides. The one who is struggling was addressed and given the opportunity to attend more English classes… a couple extra dollars goes a very long way in Cambodia.